IUPAC rules assign names to unbranched alkanes. Carbon atoms are classified according to their degree of substitution by other carbons. Cycloalkanes also only contain carbon-hydrogen bonds and carbon-carbon single bonds, but the carbon atoms are joined in a ring. Alkanes are not very reactive. Alkanes are hydrocarbons in which all the bonds are single bonds. The simplest one, methane (CH4), is also the most abundant. Large amounts are present in our atmosphere, in the ground, and in the oceans. Methane has been found on Jupiter, Saturn, Uranus, Neptune, and Pluto, and even on Halley’s Comet. Ethane (C2H6: CH3CH3) and propane (C3H8: CH3CH2CH3) are second and third. Constitutional isomers are possible; two alkanes have this particular molecular formula. In one, called n-butane, four carbons are joined in a continuous chain. The n in n-butane stands for “normal” and means that the carbon chain is unbranched. The second isomer has a branched carbon chain and is called isobutane. CH3 is called a methyl group. In addition to having methyl groups at both ends, n-butane contains two CH2, or methylene groups. Because they are different in structure, they can have different properties. Both are gases at room temperature, but n-butane boils almost 10°C higher than isobutane and has a melting point that is over 20°C higher. n-Alkanes are alkanes that have an unbranched carbon chain. n-Pentane and n-hexane are n-alkanes possessing five and six carbon atoms, respectively. Their condensed structural formulas can be abbreviated even more by indicating within parentheses the number of methylene groups in the chain. Thus, n-pentane may be written as CH3(CH2)3CH3 and n-hexane as CH3(CH2)4CH3. Cycloalkanes also only contain carbon-hydrogen bonds and carbon-carbon single bonds, but the carbon atoms are joined in a ring. The smallest cycloalkane is cyclopropane. Cycloalkanes can be substituted and named as cycloalkyl derivatives, and disubstituted cycloalkanes can be stereoisomers. In one isomer, if two substituents are placed on the same face or side of the ring, they are called cis. If the two substituents are on opposite faces, they are called trans. Substituents can also be either equatorial or axial on certain cycloalkanes, such as cyclohexane. Generally, the melting point, the boiling point and the density of cycloalkanes increase as the number of carbons increases. This trend occurs because of the greater number of bonds that are in higher membered rings, thus making the bonds harder to break. An alkyl group lacks one of the hydrogen substituents of an alkane. A methyl group (CH3) is an alkyl group derived from methane (CH4). Unbranched alkyl groups in which the point of attachment is at the end of the chain are named in IUPAC nomenclature by replacing the -ane endings by -yl. Carbon atoms are classified according to their degree of substitution by other carbons. A primary carbon is one that is directly attached to one other carbon. Similarly, a secondary carbon is directly attached to two other carbons, a tertiary carbon to three, and a quaternary carbon to four. Alkyl groups are designated as primary, secondary, or tertiary according to the degree of substitution of the carbon at the potential point of attachment. Alkanes are not very reactive when compared with other chemical species. This is because the backbone carbon atoms in alkanes have attained their octet of electrons through forming four covalent bonds (the maximum allowed number of bonds under the octet rule; which is why carbon's valence number is 4). 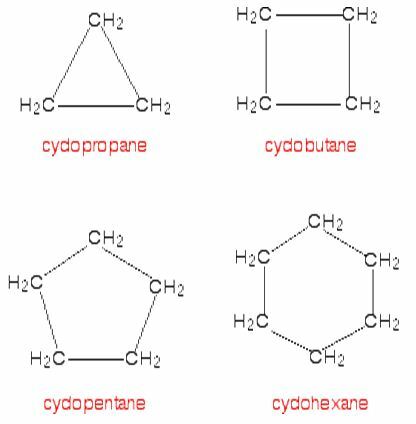 These four bonds formed by carbon in alkanes are called sigma bonds, which are more stable than other types of bond. To make alkanes react, the input of additional energy is needed; either through heat or radiation. Gasoline is a mixture of the alkanes and unlike many chemicals, can be stored for long periods and transported without problem. It is only when ignited that it has enough energy to continue reacting. This property makes it difficult for alkanes to be converted into other types of organic molecules. Alkanes are also less dense than water, as one can observe, oil, an alkane, floats on water. Alkanes are non-polar solvents. Since only C and H atoms are present, alkanes are nonpolar. Alkanes are immiscible in water but freely miscible in other non-polar solvents. Alkanes consisting of weak dipole bonds cannot break the strong hydrogen bond between water molecules hence it is not miscible in water. Because alkanes contain only carbon and hydrogen, combustion produces compounds that contain only carbon, hydrogen, and/or oxygen. Like other hydrocarbons, combustion under most circumstances produces mainly carbon dioxide and water. However, alkanes require more heat to combust and do not release as much heat when they combust as other classes of hydrocarbons. Therefore, combustion of alkanes produces higher concentrations of organic compounds containing oxygen, such as aldehydes and ketones, when combusting at the same temperature as other hydrocarbons. Methane through Butane are very flammable gases at standard temperature and pressure. Pentane is an extremely flammable liquid boiling at 36 °C and boiling points and melting points steadily increase from there; octadecane is the first alkane which is solid at room temperature. Longer alkanes are waxy solids; candle wax generally has between C20 and C25 chains. As chain length increases ultimately we reach polyethene, which consists of carbon chains of indefinite length, which is generally a hard white solid.